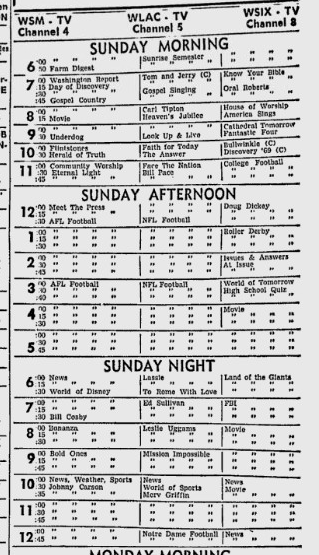 It's a huge college-football Saturday, Nov. 22, 1969. Looking at the TV listings in Hopkinsville's Kentucky New Era, it appears we're going to get at least two and maybe three college-football games on TV. No. 1, national-champ Ohio State is 8-0. Under its new coach, Bo Schembechler, Michigan is 7-2 and ranked 12th. And here's the game: Part 1, Part 2 and Part 3. What an interesting and pleasant fellow that Woody Hayes is. 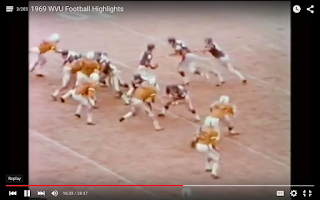 I told you the 1969 college football season was a cracker. 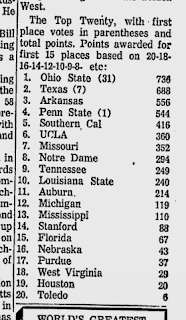 Keep an eye out for rumors that Notre Dame might go to a bowl game -- for the first time since 1925. Don't even get me started on Woody Hayes. By the way, I intentionally linked Part 1 of this Ohio State-Michigan game late enough that you don't hear who is going to eventually win. Oh, also, try not to look at the name of the YouTube video. Wait, did Bill Flemming just say that Stan White is kicking (and missing) extra points for Ohio State? Wow ... but Michigan led 21-12 at half and just sort of stuffed Ohio State the rest of the way. Every time I looked up, somebody else was intercepting Rex Kern, who has had all sorts of headlines in the Kentucky New Era over this season. Oh, well, Michigan wins easily. We'll have a new No. 1 next week. This game, of course, is what made Bo Schembechler famous. It also means that the Texas/Arkansas game at the end of the year is the real showdown for the national championship. 1969 me would have been almost exactly as surprised by this game as 2015 me was by Michigan State's victory over Ohio State last weekend. I will say this for that game: It was a great game if you had all the 1970s Topps football cards like I did (do). Thom Darden, Jim Otis, Stan White, Billy Taylor, Jan White, Mike Sensibaugh ... they all turn up on Topps cards in the 1970s, lots of them. And it was great to see Dan Dierdorf doing the wraparound interview for ESPN Classic. I think Dierdorf is a very underrated announcer. Tough day for the nation's big stars. Oklahoma's Steve Owens sees his 17-game streak of scoring at least one touchdown come to an end, as the Sooners lose, 44-14, at home to Nebraska. That's six straight wins for the Cornhuskers after a 2-2 start on the regular season, with the losses coming to Southern Cal and now-No. 7 Missouri. Per the Los Angeles Times: "Pete Carroll had taken a road trip with some buddies and was sitting seven rows from the top of the Coliseum among a crowd of more than 90,000." 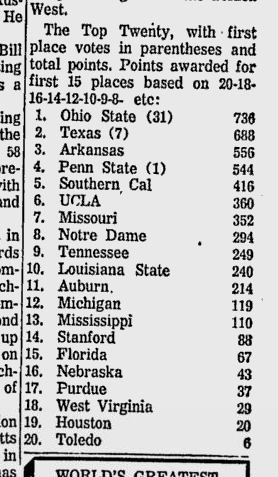 UCLA's tie was in conference, against Jim Plunkett and Stanford. USC tied Notre Dame, so the Bruins knew another tie would send USC to the Rose Bowl. "We had to go for two [after] both touchdowns because of that," (UCLA quarterback Dennis) Dummit says. Sam Dickerson certainly appeared to me to be out of the back of the end zone on the last play, but the newspaper photograph is convincing. Well, good for USC ... back to the Rose Bowl, this time to face Michigan. Time to get Steve Douglas married off again. 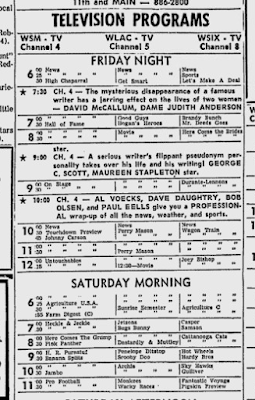 7:30--MY THREE SONS: Steve and Barbara are married. CBS (5). Chip: "Dad, I've heard about bachelor dinners. Is this all that happens?" Steve: "Well, yeah, when the bachelor invites only his sons and an uncle." I love how Uncle Charlie calls people, "Dumb-dumb." I never understood the whole deal with Uncle Charlie. How is he Steve's uncle? Is he the brother of Steve's father? Or the brother of Steve's mother? Or is he just an old guy that Steve has known for years, and who has the honorary title of "Uncle"? Because I have to tell you that to me, it always seemed like he was from a completely different family. Charlie is so horrible. It's really great how they wrote that character. WHAT IS THE DEAL WITH UNCLE CHARLIE? How is he related to this family? Why does he have an accent, and what kind of accent is it supposed to be? I didn't know any of this either (well, most of it), from Mental Floss: "The premise of My Three Sons was to showcase the trials and tribulations of an aeronautical engineer widower (Steve Douglas) and his three boys (Mike, Robbie and Chip). Since Steve's job required long hours, some household help was obviously required. Enter William Frawley as Bub O'Casey, Steve's father-in-law. Bub served as chief cook and bottle-washer, as well as disciplinarian for the boys when Dad wasn't home. Frawley nabbed this role shortly after his tenure as "Fred Mertz" on I Love Lucy, and was quite pleased to have another steady job. However, after five years his failing health made him uninsurable and he was replaced by the even more curmudgeonly William Demarest, who appeared on the scene as Uncle Charlie, Bub's brother." OK, so he was from a different family. That makes sense, although it makes you wonder how Steve married into that family. I choose to believe that his wife was some sort of glamor girl from a poor background -- like the character Audry Hepburn plays in "Breakfast at Tiffany's." I'm pretty sure I never saw any of the episodes with William Frawley. Similarly, I never saw any of the black-and-white episodes of "The Lucy Show." It seems like there's also an issue here about whether Steve's wife ("Miss O'Casey") was an Irish Catholic, and whether Steve had to convert to Catholicism to marry her -- which was usually the case in pre-Vatican II Catholicism. But I'm not going to worry about that. But maybe in this version of the same story, Fred McMurray wasn't married when he started the affair with a working-class girl, and everything worked out for all concerned -- at least until his wife died, which must have been awful. Anyway, at least his wife wasn't like the Barbara Stanwyck character that Fred McMurray gets involved with in "Double Indemnity." That relationship didn't really work out for anyone. TV is so good. TV! 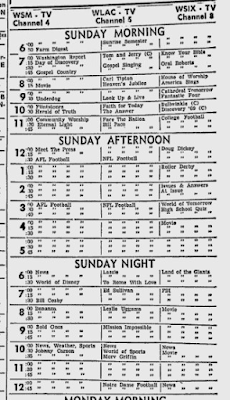 Interesting that CBS's My Three Sons was doing this widow-widower marriage in the same autumn that ABC's Brady Bunch was putting together Carol and Mike. It was a big era for dead parents. Ah, good for the new Douglases! 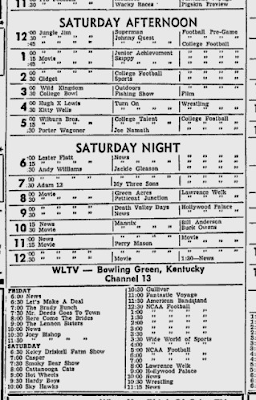 By the way, on Saturday, Nov. 22, 1969, Kentucky lost to No. 9 Tennessee, 31-26, at Stoll Field/McLean Stadium to close Coach John Ray's first season with a 2-8 record. Side 1 - "STOLL FIELD: In 1880 the first college football game ever played in the South was held here at what was eventually named Stoll Field. 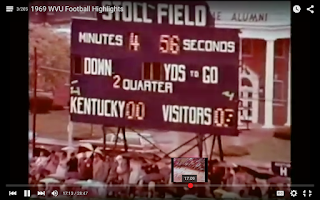 It was dedicated in 1916 at the Kentucky vs. Vanderbilt game and was named in honor of alumnus and long-term Board of Trustees member Judge Richard C. Stoll. 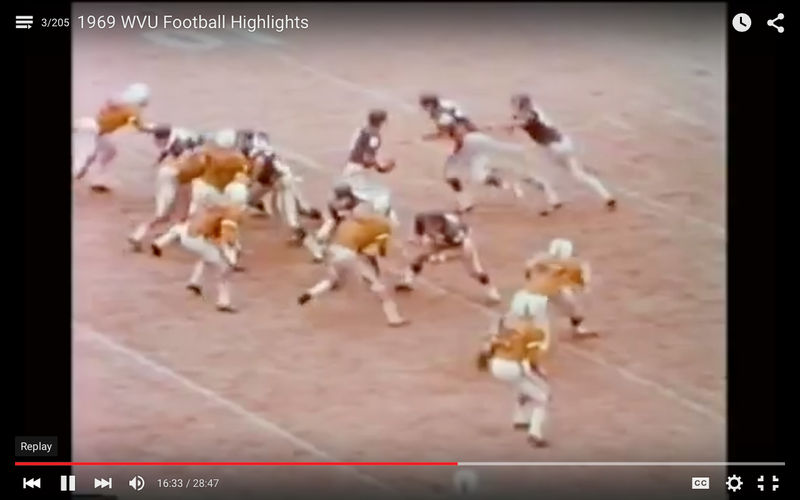 The field was the setting of early football games and an integral part of student life. Side 2 - MCLEAN STADIUM This field, which once pastured President Patterson's cows, was used for military training during World War I and in 1924 it held McLean Stadium. It was named for Price McLean, an engineering student who was fatally injured in a football game in 1923. 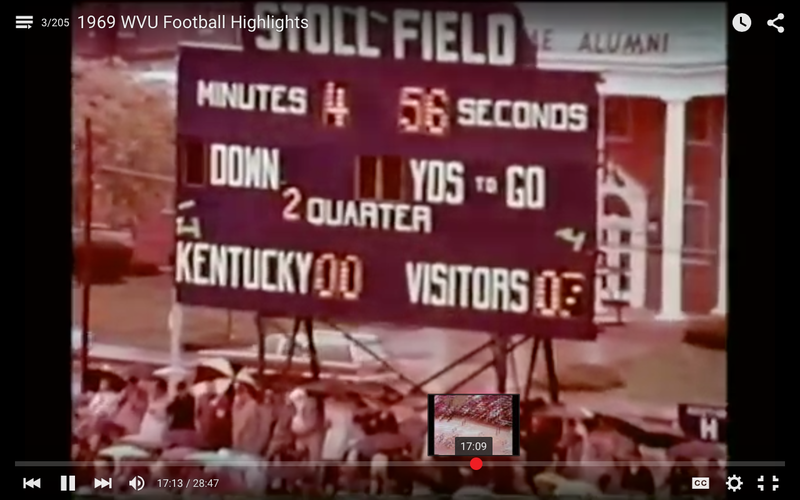 McLean Stadium was the site of Kentucky football games until they were moved to Commonwealth Stadium in 1973. We just need to give John Ray more time. You can't tell anything from one season. Notre Dame doesn't typically accept invitations to post-season bowls, but the AP says the No. 8 Fighting Irish might be headed to the Orange Bowl or Cotton Bowl (potentially against No. 4 Penn State in either case). YEAHH! I knew you'd be on top of this story. 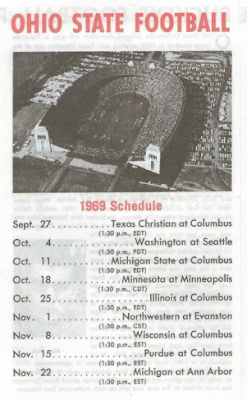 We have a 1969 Class 3A KHSAA football champion: Saint Xavier beat Butler, 15-0, for the title on Friday, Nov. 21, 1969. Both the Louisville city region and Jefferson County region winners, respectively, entered the game with 10-0 records. In the Class A semifinals on Friday, Bardstown upset No. 1-ranked Tompkinsville, 15-7, while Mount Sterling took down Lynch, 16-14. In Class 2A, western Kentucky's last representative, the previously unbeaten Mayfield Cardinals under first-year coach Jack Morris fell to Elizabethtown, 26-0. That puts the Panthers into their third straight 2A state championship, where they'll play Lexington Bryan Station, a 28-6 winner over Corbin on Friday. Oh, man ... I FORGIVE YOU, VIKKI CARR! I FORGIVE YOU!!! "Can you teach her all the games that little girls play?" Just kills me every time. I'm not forgiving her until I know more about what she did. After all, she did apparently lose custody of her daughter. That didn't happen all that often back in the 1960's. Almost time to start getting serious about Christmas. I always forget that The Tonight Show was on Sunday nights, as well. People are watching TV in the old home movies they post on YouTube, but you can never see what's on the TVs.